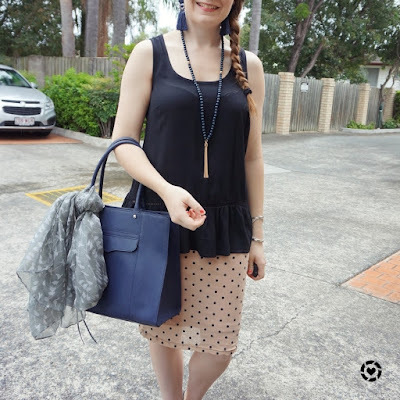 Away From Blue | Aussie Mum Style, Away From The Blue Jeans Rut: Peplum Tops, Pencil Skirts & Rebecca Minkoff MAB Tote | Weekday Wear Linkup! Two great outfits ideal for work. I can't wait for warmer weather - we still need warm coats and woollies here! Mica, I love a peplum tank with a pencil skirt for work, great formula! Especially when it's humid, who wants something tight and that traps the heat? Great look. 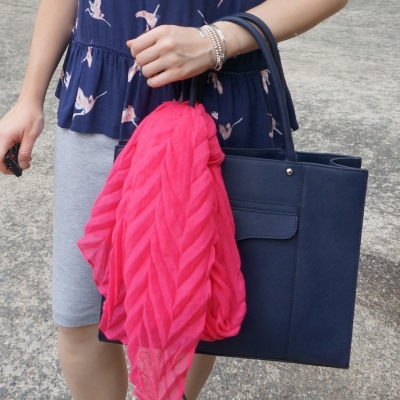 Your tote is pretty and I especially like it with the pink scarf! Love the style of both of these tops! I adore the pop of pink on the bag of the second look. Thanks for the link up! You're very lucky that you can wear this style of tank to work! So much more comfortable in the heat! And naturally I love that blue RM bag! Both lovely outfits as always, Mica:) I love how you wear these cute outfits but still work-appropriate. 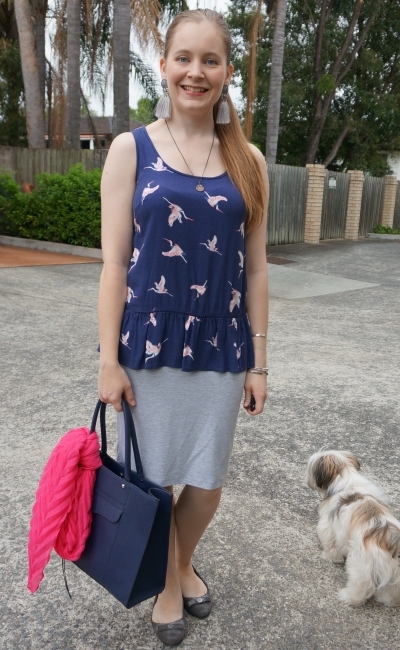 And I think I've mentioned before, but I really do love that KMart bird tank top. I never wore peplum tops until I had kids. They are so good to hide the mum tum! Both outfits are stylish hun and loving the peplum top! Have a wonderful week ahead. I just love the peplum tops. They both look so nice with those skirts Mica! You always have such cute laid back office style! I don't know that I have ever tried my peplum tops with pencil skirts, and you are certainly inspiring me to give it a try! I adore your polka dot pencil skirt and your crane peplum top is too cute. Have a wonderful week, Mica! I really appreciate these ideas, Mica. I have quite a collection of pencil skirts which are *not* getting enough attention. Adding a peplum top (which I don't usually go for) is an easy update. Also, I love the scarf on the handbag, not a new idea, I know, but I completely forget about it during the summer months. Your lucky you can wear sleeveless top to work. When its warm out. We can't where I work at. Have a great week. I hope your weekend was good. We started to declutter are house. The peplum tops and pencil skirts go together so well! They are a perfect combination to wear to work or on a day where you want to be more put together. I love how the scarves look tied to the bags too! I hope you have a wonderful week! The coin crest necklace is lovely, and I really love the length of the peplum tank. Wishing you a great new week dear! I am finally back from an exhausitng week. Excited already for a relaxing weekend though, and it's only Monday, haha. That is such a cute look. No wonder you wore it again. You look great. I love the look of a peplum top. It is so flattering! Gorgeous tassel earrings. I just love this Rebecca Minkoff bag! And those polka dots are perfect! I hope you are having a great week! I love these peplum-bottomed tanks on you with the pencil skirts - they are both extra-special with that ruffled detail and it elevates them beyond t-shirts. Very nice for an office look! I love the colour mix here too - pink and blue and grey is so classy. Have a good week, my dear! Those peplum tops are very cute and they look so darling on you! A skirt is always a good option, so chic. I'm going to call you The Peplum Princess! Nice cool looks here, Mica, guess it's still really hot down-under. I feel like I say this every week, but you have the best bags! That Rebecca Minkoff tote looks like such a good one for work and everyday. I feel like I need a tote like that now! Peplum tops look great with pencil skirts! Love the dots and bird prints and the Rebecca Minkoff bag is so beautiful. I also love peplum and polka dots! That polka dot skirt is just so pretty! Can't stop looking at that pretty necklace and I see you're going full throttle with the tassel earring trend - they suit you Mica. Love both pencil skirts and your bag! Hope you have a great week! I really like the longer length and looser fit of those pretty peplum tops! They look lovely with pencil skirts and are a great outfit for warmer weather office wear! Hope you have a nice start to your week! Brilliant idea with the scarf tied in the bag, you always have the prettiest scarves. I like your dotted skirt too, so good around this time of the year for work. It's pretty hot in Sydney atm, hopefully it will cool down in the weekend as we plan to hit the beach. Hope you have a chill midweek. Has been so hot here too! Was hoping the cyclone might have cooled it down a little, but hasn't by much! such a stunning bag - it looks great in both those outfits dear. I'm loving all the navy details here, Mica! I really like that navy birds print tank. And your bag is to die for. Cute outfits. Love that navy bag. Totes are really my favorite type of purse. I love all these outfits! They are so cute. That first skirt is so beautiful! love it! I would totally pair with tight black top and nice black heels! Or even red :) Ah in love! 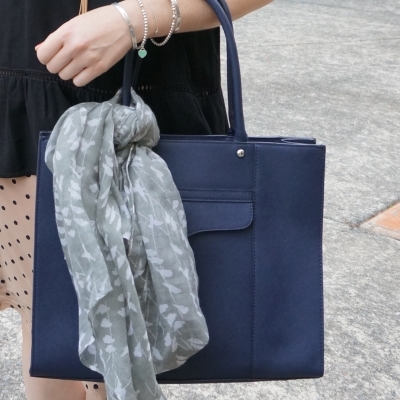 Tying a scarf on a bag instantly elevates any look! Love your polka dot skirt! Ugh I hate humidity. Peplum tops are so fun, you did a great job styling yours. I use to have a peplum leopard print skirt, it was so fun to wear! Cool pencil skirts, I love both of them and you're always super stylish! Those tops are so classy! I love these looks! I love how you dress up your bags with scarves! I should try that! Both of these looks are so cute! 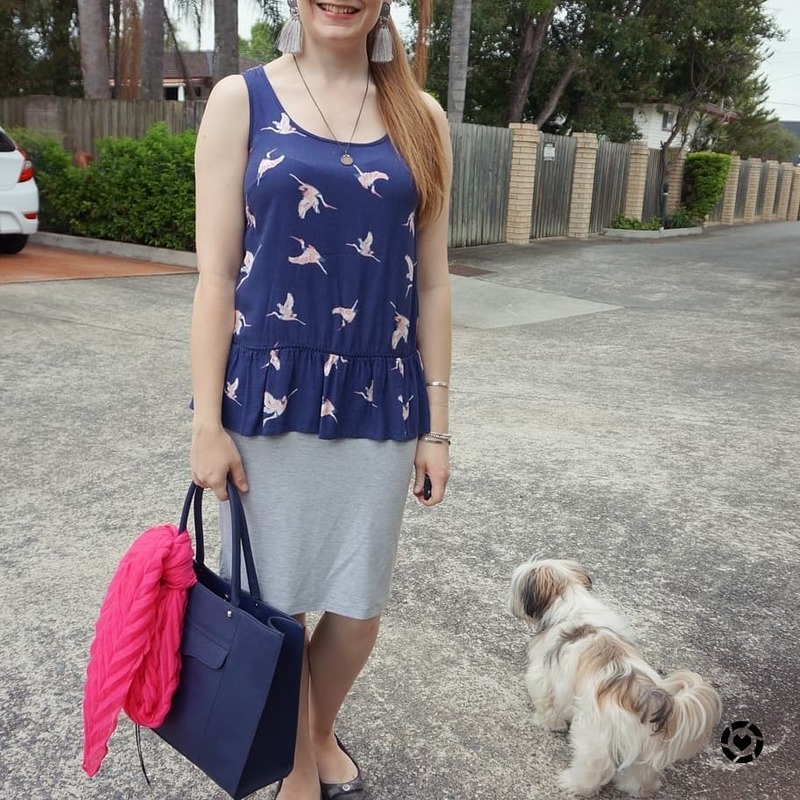 Love your bird print top! That bird print tee is the business! Kmart have some really cute tanks at the moment! I don't have many peplum tanks, but they definitely look lovely. Both of your outfits are great. I love that you added a fun print in both looks. I love both of these looks, Mica! The first one is my favorite. I love those polka dots. I love how cute those peplum tanks are! I love how they look with the pencil skirts too, it gives the look a laid-back vibe but still totally office-friendly. I love the length of these tanks! Perfect for summer layering :) Have a great week!! P.S. how did I miss you were doing a link up?? I might start taking some photos of my work outfits and join up next time! Is it weekly? Yes, it's weekly! I'd love it if you could link up! I love the scarves you have put on your bag, that's so pretty! Especially in pink! peplum tanks work so well with pencil skirts - what a fun combo!